Summer season in the Madison (WI) area is short. Take advantage of the warm months and rent this amazing inflatable. With fantastic beach themed details, this inflatable offers great entertainment for any type of event. 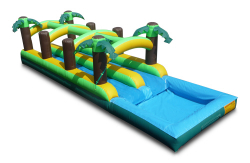 Whether your party is beach theme, Hawaiian theme, or you just want to have fun on a hot day, our Slip and Slide inflatable will be the perfect tool to provide fun for your party. The water pool on the end of the Slip and Slide provides a safe and fun landing. This Slip and Slide offers 36 feet of wet fun and excitement. You can race down the double lanes or just enjoy the water fun. Slip & Slide is a great way to promote enjoyable and healthy activity, and will add excitement and value to many outdoor events. Price: $299.00 per 7 / hrs. Price: $299.00 per 3 / hrs. Price: $299.00 per 4 / hrs.